Not only were new radios being designed as all-wave, but tuning kits were sold for radio service shops to retrofit existing sets. Covering such a wide spectrum of tuning required banks of selectable inductors and capacitors. Supplying a one-size-fits-all module required adequate shielding and isolation to minimize coupling to and from the all-wave tuner. This unit was featured at the 1934 Paris Radio Exhibition. My 1941 Crosley Model 03CB console radio is an all-wave type. 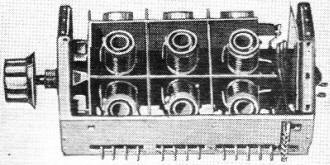 In the recent French Radio Exhibition, the "all-wave" tuning coil system illustrated above was shown, the coils being placed in separate shielded compartments. 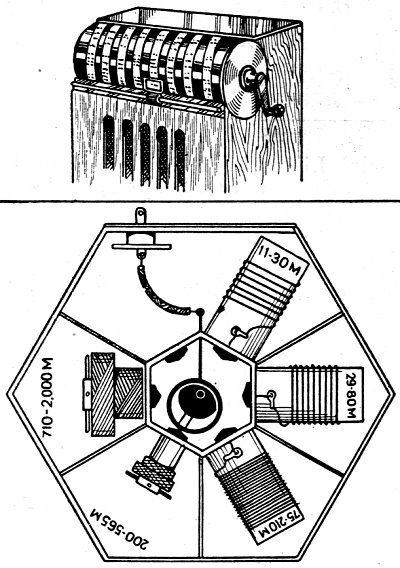 The lower drawing in the group above shows the arrangement of the Cam switch used in the new French all-wave tuning coil assembly, while the upper picture shows the new French spiral dial with a traveling indicator which follows the spiral. We have reviewed in these columns the radio shows which were held, this year at Olympia, in England, and at Berlin, Germany. And now we have the eleventh annual show held in Paris, at the Grand Palais. 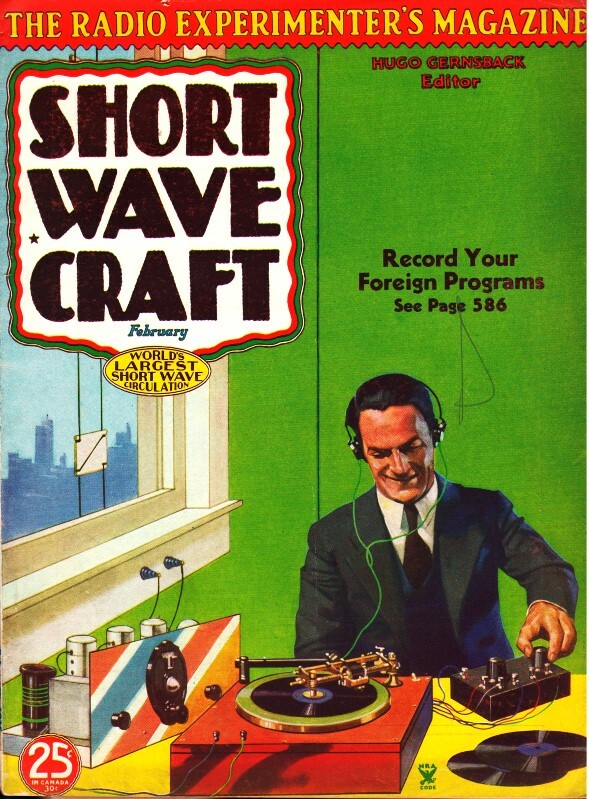 While the number of short-wave items appearing at this show is less numerous than at the other two shows, several really novel and worthwhile items have been displayed in French magazines describing the show. The first of these is a spiral dial with a traveling pointer which follows the spiral, as shown in the sketch, here. This automatically produces a vernier tuning action, due to the unusual length of the tuning scale, but also permits notations and loggings to be made directly on the scale, which is extremely useful for the short-wave receiver. The tuning can be accomplished either with a dial or crank at the end of the scale, as shown, or a cable drive could be attached to permit a knob to be used. The second item is an interesting al-wave tuning system, which has coils arranged in a circle, in individually shielded compartments, and a cam switch (differential) included as an integral part of the assembly to permit shifting from one band to another. The arrangement permits the coils to be completely shielded, and still maintain exceptionally short leads, and the switch, which is usually the stumbling block in such complicated set-ups is actually more simple and more positive than most wave-change arrangements. Another advantage of this system of all-wave receiver coil construction is in the flexibility - in the matter of how many coils can be included. In the arrangement, any desired number of coils can be switched in at the same time, to cover the number of tuned circuits required by the circuit. This is shown in the photo here which shows a unit having 3 sets of coils. Practically all the receivers shown at the Paris show, according to Toute la Radio, that lively little French magazine, are superheterodynes, while considerable effort has been shown by manufacturers to improve the external appearance of the sets. There are quite a number of A.C.-D.C. models in evidence, though the majority are A.C. operated. Sets of the D.C. type were notable by their absence. When the Lucerne agreement was signed the wavelength plan provided no channel for the Eiffel Tower station, and everyone assumed that it would be closed down forthwith. However, it just went on broadcasting and helping to make yet more chaotic the chaos that prevailed in Europe. Some months ago it was announced that the Eiffel Tower was immediately to cease operations on the long waves and blossom out as a short-wave broadcaster. Once again nothing happened; the Eiffel Tower just carried on as before. Now, the Minister of Posts and Telegraphs has at last taken charge. He announced a short time ago that the Eiffel Tower was clearly superfluous as a broadcasting station and that it was causing a great deal of unnecessary interference. It must be closed down and used in the future only for occasional experimental transmissions. M. Mallarme, the Minister of Posts and Telegraphs seems to be a man of his word, for according to Popular Wireless, the station has not been heard since, though there is some speculation in the above magazine that the station will pop up again on the long waves. The old Eiffel Tower seems like King Charles, to be "an unconscionable time a-dying."